The Library is always making new acquisitions. One of the latest and certainly the largest this year, is the life’s work of a notable local historian of Prestwich, Ian Pringle. He donated a substantial part of his collection to the library in 2017. When I accompanied the librarian to Ian’s tiny flat to collect this we thought he must have discovered the secret of the Tardis as he produced more and more material from every nook and cranny. Sadly, Ian died earlier this year and the bulk of the collection came to us as a bequest. My task as a volunteer has been to sift through hundreds of documents and thousands of photographs as well as maps, prints, engravings, plans and postcards. The documents are now largely listed and stored in six large boxes, but the photographs remain in shoeboxes, albums, lose in packets or unsorted in boxes. This is a work in progress! Ian devoted much of his life to documenting and fighting to preserve the heritage of Prestwich. His knowledge of the area was unsurpassed. The subject matter he studied was wide but there are several discernible themes. The great houses of the landed gentry and the people who lived and worked in them, notably Heaton Hall and Park and Philips Hall and Park. He also documents their history as places of recreation after they became publicly owned. The ‘grand houses’ of industrial Manchester, built in rural Prestwich by the captains of industry and commerce to escape the noise and fumes that their wealth was built upon. The churches of Prestwich and in particular the parish church of St Mary’s and its striking graveyard. The church is best known these days for its occasional appearance in episodes of Coronation Street. However, it has a venerable history, architectural merit and numerous fascinating tombstones. Prestwich Hospital, by far the largest institution in Prestwich and for many years one of the largest institutions in the region. It is quite startling to see it described on numerous maps, some not very old, as ‘The County Lunatic Asylum’. Many of its former residents lie in unmarked graves in St Mary’s Churchyard. Photographs of old Jewish graveyards and buildings associated with Jewish migrants and their descendants, reflecting the strong links between Prestwich and its large Jewish population. There are also many photographs which reflect the changing face of Central Manchester across the decades. The demolition of the old and the creation of the new is theme in these photographs. Some of these striking images have caused me to look at Manchester with fresh eyes and notice some features I have previously missed. Looking through this collection has been a pleasure and a privilege. There are so many items that I found striking and which offered a real insight into our social history. I’ll mention a few. 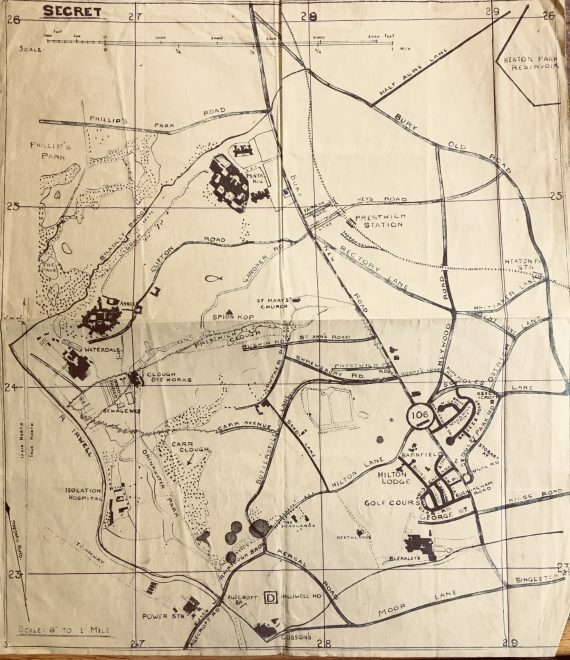 From 1943 a hand-drawn map of Prestwich created by the local Home Guard Unit. This is accompanied by a hand-written note from their Battalion Headquarters congratulating them on its quality. From the same period is an aerial photograph of the reservoirs to the north of Heaton Park, annotated in German and marking anti-aircraft defences. Possibly used by the Luftwaffe to identify potential targets. 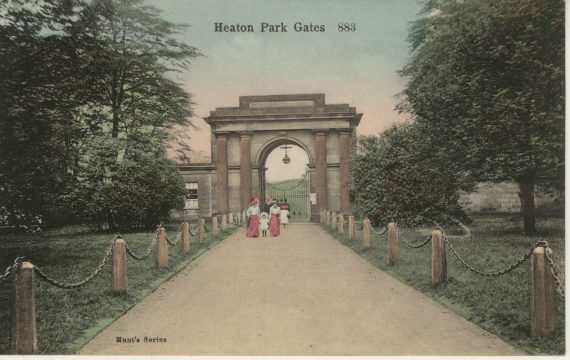 There are so many wonderful pictures of Heaton Park through the decades from the nineteenth century to the twenty-first century. They reflect its long journey from a place of privilege where the Prime Minister, the Duke of Wellington was once a guest of the family, through to its current role as the people’s park and the lungs as of a great urban conurbation. 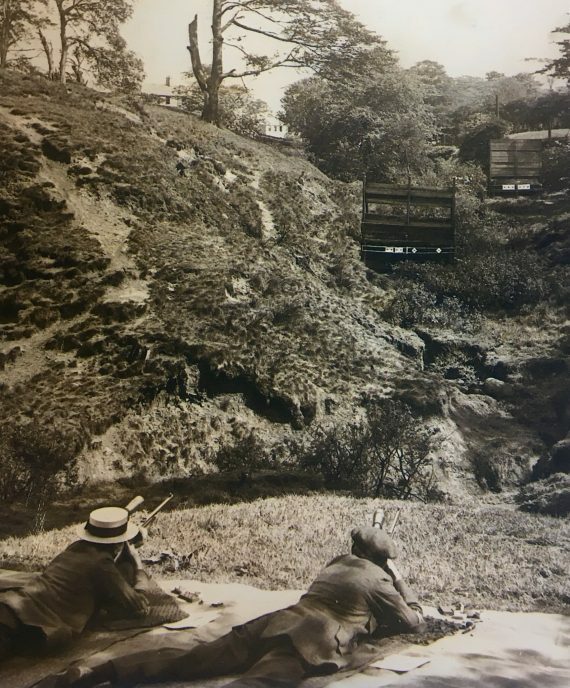 There is a wonderful photograph from 1911 of two men wearing straw boaters at a rifle range in what is now St Mary’s Park. Worryingly there are houses clearly visible behind their targets! I came across two unexpected connections between Prestwich and New York. One of the many oil paintings that used to hang in Heaton Hall and which Manchester Council declined to buy in 1902 is a portrait of Eliza Lawrence by Sir Thomas Lawrence, which now hangs in the Metropolitan Museum in New York. Ian’s collection contains a print of this on silk. 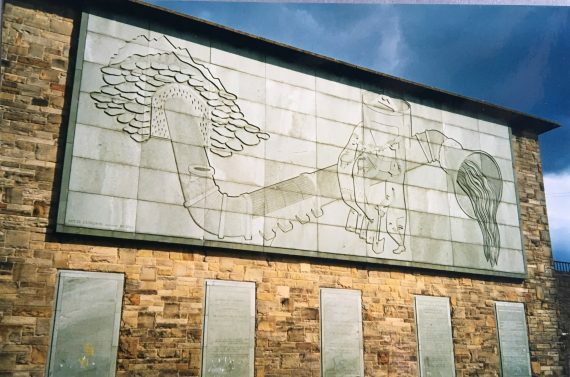 The second connection is the stunning stone frieze created by New York Artist Mitzi Cunliffe on the wall of the pumping station at Heaton Park Reservoir. I first saw this while driving my children to school along a nondescript suburban street. Ian has some lovely photographs of it. The final item I want to highlight was completely unknown to me. While sorting through some photographs I came across some breathtakingly beautiful images of the interior of a building on Deansgate in Central Manchester. 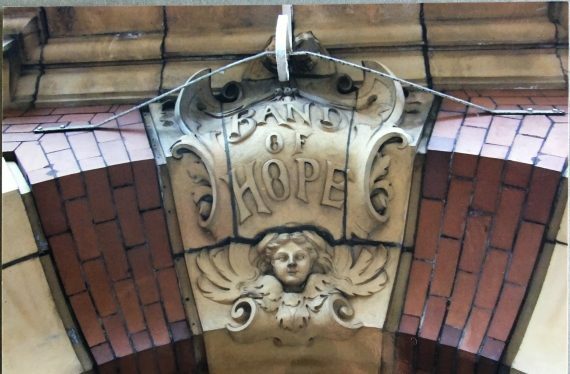 This was the former offices of a temperance organisation, the Band of Hope. When I was working on this collection it was obvious to me that this could be a fruitful resource for local historians. The more I got to know it the more I thought that it could also be something else. It brought to mind a TV series by the historian Michael Wood in which through the close study of one village he sought to discover wider insights into the history and development of the nation. A close study of this collection would certainly offer insights into such themes as industrialisation, urbanisation, suburbanisation and the social history of this region. This is a lovely collection which we are honoured to hold in memory of Ian Pringle, a man who devoted his life to preserving and recording both what is beautiful and ordinary, quirky and non-descript. So glad Ian’s collection has found a safe home . We were great friends of Ian’s and shared his interest in Local History . Members of Prestwich Heritage and the Friends of Heaton Hall along with Ian. Shared in many of his projects. We will miss him. He always seemed to have the answer to a question we needed answering . Thanks to you both. The collection has all kinds of interesting corners that we’re looking forward to working with. We’re very grateful that Ian chose us to look after and develop his collection and we’ll do our best to commemorate his efforts in this way. Just noted . 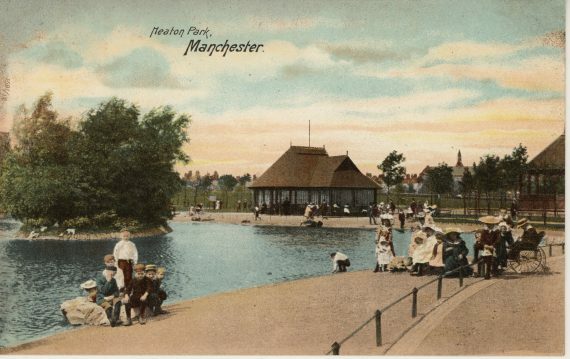 The postcard of the lake stating that it is Heaton Park is not correct. Not sure which park it is, Manchester Park or maybe Heaton Park Newcastle, however not Heaton Park Prestwich. A bit of a mystery!! Thanks Amanda Jane – do send us a copy if it’s not too much trouble. We’d like to have it for our collection, and if it’s OK with you we’ll put it online too. The postcard of the Lake is Whitworth Park in its better days. Lake filled in about 1954. Thanks, Andrew! We’ll revisit this bit! Interesting mistake on the part of the postcard manufacturer then – perhaps that’s why it caught Ian’s eye? What a wonderful real life story and such a privilege to be involved in. 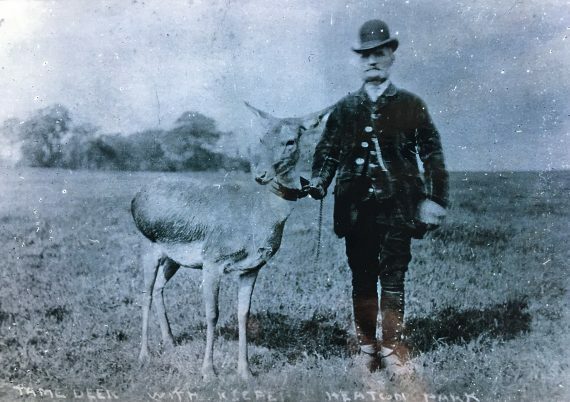 I had an ancestor who worked as a gardener at Heaton and his father before him Thomas Webster who also worked for Sir Thomas Egerton also as a gardener and is buried presumably in St Marys’s. I shall follow your blog with interest. Thanks, Sue – do keep following, we’ll be back with more. Families working on these great estates must often have had many generations in service. Ian was my lovely friend. He would be delighted by your very kind words and serious interest in his archive. Your final sentence describes Ian the man, as well as his collection. He is much missed by us all. Thanks, Lucy, for your post. We will endeavour to keep Ian’s work documenting the world around him alive and well and get it seen by more people. The photo of the Home Guard & map was interesting. My grandfather James Cross was in the H.Guard in Heaton Park. I have a well preserved invitation card to all members of No. 3 Company to a :convivial evening: at the George Hotel Bury New Road, Sedgley Park. It has the signatures of approx. 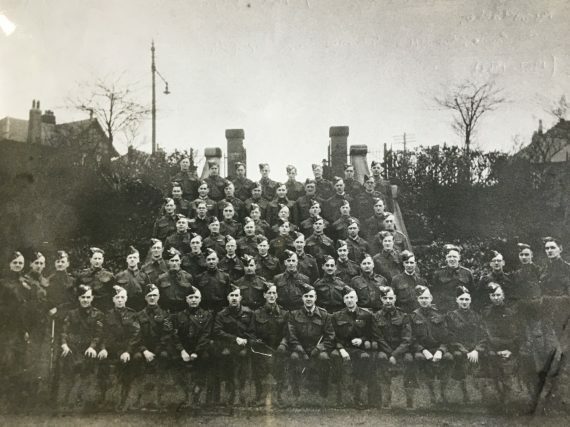 14 members of the Company. Some may be in the Photograph that you display. Thanks, Barry. We’d be interested to see the invitation or a picture of it. We’re planning to put plenty more of Ian Pringle’s collection online, but it may take a little while to do so. Mitzi Cunliffe also designed the statuette for the BAFTA awards. Just to add that Mitzi Cunliffe also designed for Pilkington Lancastrian Pottery at Clifton junction – another great love of Ian’s. Thanks, Judy. We’re doing more work on Ian’s collection at the moment, and it’s nice to hear more about him and his interests here.